Gather stakeholders: Gather allies from all departments so you have the support you need to create the customer journey map. Conduct research: Collect all the information you can about the thoughts, feelings, actions, motivations, expectations, goals, needs, pain points, barriers, and questions a customer may experience during their journey with your company. Build your model: Visualize touchpoints, channels, and actions taken by the customer. Refine the design: Recruit the help of a designer to make your deliverable visually pleasing. Identify gaps: Note any gaps in your customer experience, places with information overlap, or poor transitions between stages. Implement your findings: Assign the responsible parties to bridge the gaps you've found. As the number of channels available to you for customer interaction grows, your customers’ expectations for a seamless experience, regardless of the channel, is growing even faster. So creating a clear vision for the strategy behind customer interactions is no longer an optional “nice-to-have”— it’s essential. Luckily, one of the most powerful tools for understanding both the “as-is” customer experience and for visualizing and implementing the ideal experience is a customer journey map, and Lucidchart makes it easy to create one. Want to create a shared vision for customer experience that is ready to scale with your organization? 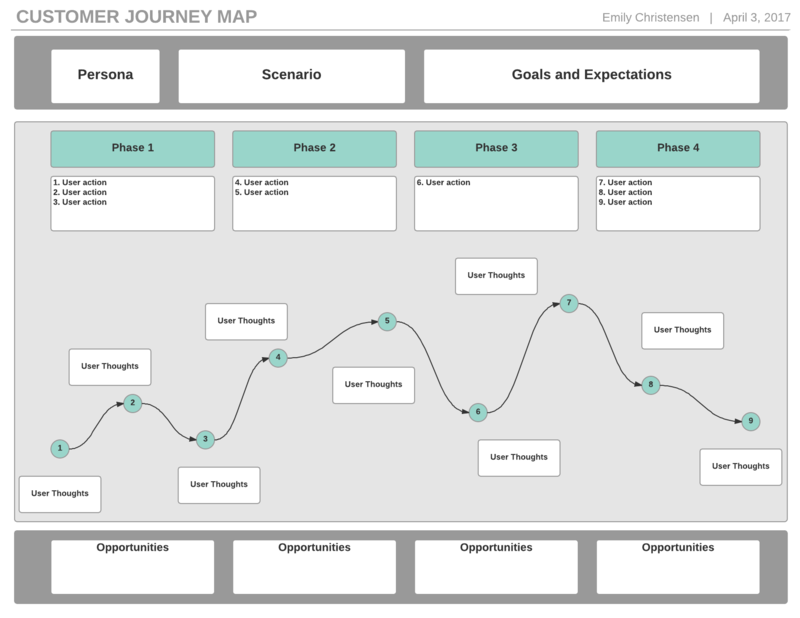 Check out our free customer journey map template that’s easy to edit and share with your team. A customer journey map is an essential visual tool that provides connective tissue for everything from customer frustrations to customer interaction data. It shows exactly what communications the customer is receiving from any team in your organization and what actions you would like the customer to take. Before we launch into the particulars of customer mapping, let’s make sure we’re on the same page with some important terminology. 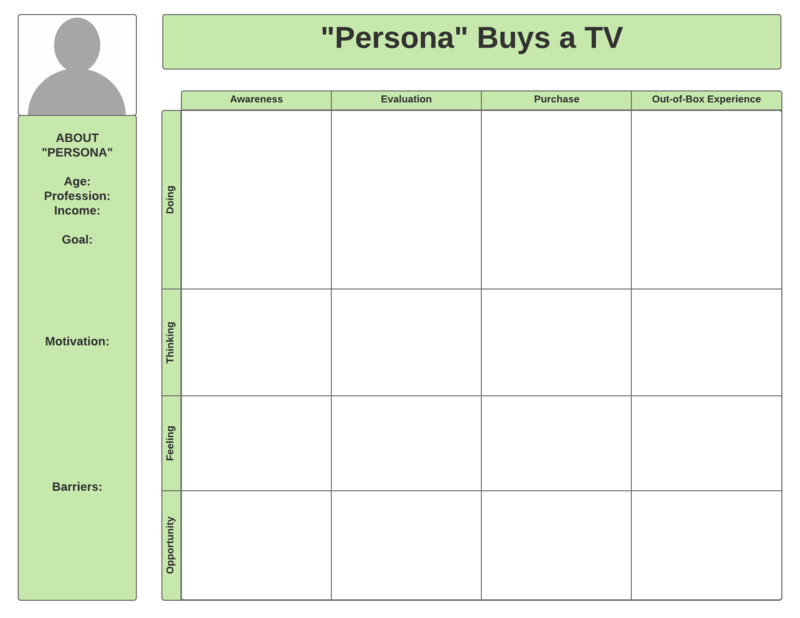 Persona: a generalization of your ideal customer group. Basically, a persona is a customer profile that includes demographic and psychographic information about people whom you can best (and most profitably) help through your business solution. Understanding who your customers are and what preferences they tend to have will enable you to identify opportunities for your company to interact with your targeted persona effectively. Touchpoint: any interaction that a customer has with your organization, product, or brand. Touchpoints can include anything from a customer’s first visit on your website to their experience with your social media to their in-product experience. Moment of truth: a touchpoint that is pivotal in the customer experience. Customer journey mapping: the process of understanding and visualizing your customer’s comprehensive experience with your organization, product, and brand across multiple touchpoints, channels, and departments. This is where data and storytelling interweave to create meaningful customer insights. Awareness: Your customer becomes aware of your category and the problem that they need to solve. Consideration/research: Customers research various ways to solve their problem, deciding whether or not they want to purchase. Evaluation: Customers decide to purchase and evaluate various options. Purchase/commit: Customers purchase the product/service. Onboarding/out-of-box experience: Customers are educated on and interact with the product or service. Retention: Customers consider staying with the same provider, switching providers, or discontinuing the product or service altogether. Advocacy: Customers invite others to experience the product/service. Whether you choose to use six, seven, or any other number of stages, remember that a customer journey map is about the customer, not about your organization. Consequently, these categories do not refer to your organization’s evaluation or research processes, rather to the customer’s evaluation and research of several product options. The best way to identify these phases is to talk to your customers and really build out your persona to understand how they make decisions and move toward purchase. Don’t have that data on hand? Make your first draft of a customer journey map based on your hypothesis, and continue to build it out as you get more customer information (see below for more info). Without an essential understanding of your customers and their needs, a customer map will not lead you to success. So now that you have the basics in mind, let’s start your visualization. Customer journey maps can become complicated unless you keep them focused; although you may target multiple personas, choose just one persona and one customer scenario to research and visualize at a time. If you aren’t sure what your personas or scenarios might be, gather some colleagues and try an affinity diagramming exercise in Lucidchart to generate ideas. To make sure that your customer journey map gains the traction it needs to make a difference in your organization, create demand for the information from the beginning by getting key stakeholders on board before you start your research. You will want to gather allies from all departments so that representatives from the entire company are behind you. Having a group of stakeholders from multiple departments will also give you ready access to unique perspectives and insights about the customer journey and the best ways to improve existing processes once the research is done. In this step, you will try to collect all the information you can about the thoughts, feelings, actions, motivations, expectations, goals, needs, pain points, barriers, and questions a customer may experience during their journey with your company. The more thoroughly you can get inside their head, the better you can cater your product or service to meet their needs. Again, developing your first customer journey map may start out as a hypothesis before you have the information you need to more accurately reflect what is happening. A hypothesis can help you maintain focus and identify gaps in current understanding so you know what questions to ask and where to invest the most time. To make a hypothesis, send your allies back to their departments to look for any records, reports, or other pre-existing data about the target persona. Then, compile your preliminary findings to draft what you think the customer journey may look like. 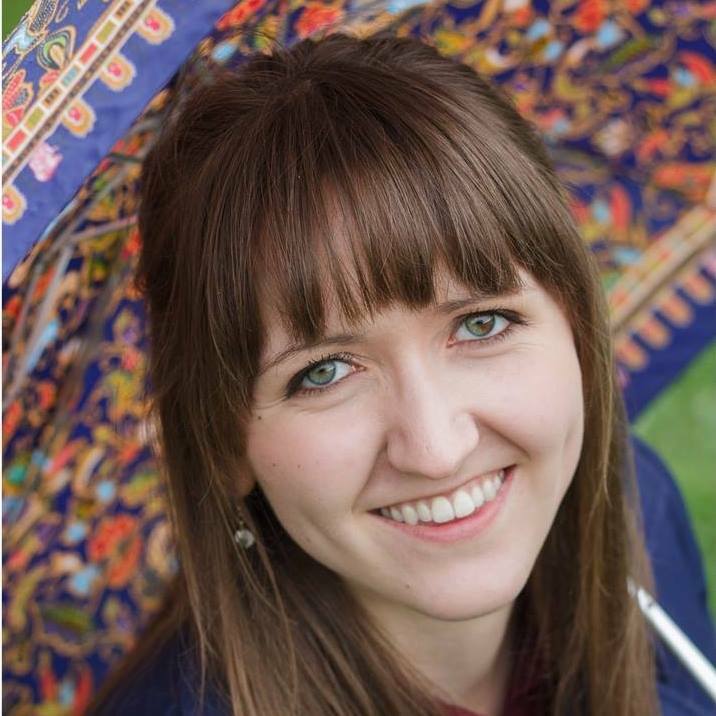 You may want to create an empathy map in Lucidchart to clarify your thoughts during this process. Remember that this is just a hypothesis. You will either validate or disprove it as you do more heavy-duty research. Collect in-context observations of customers using your product. Talk to front-facing employees that regularly interact with customers. Send digital or paper surveys to users. Scour customer support and complaint logs. Pull clips from recorded call center conversations. Monitor discussions about your company that occur on social media. Look at records from client advisory board meetings. Gather Net Promoter Score (NPS) data. Continue collecting data until you reach saturation (meaning you hear the same thing over and over again), or until your time and resources are exhausted. Open a Lucidchart document and start organizing your data visually. You’ll pass your draft to a designer later, so don’t worry too much about aesthetics; your focus is content. The model will be most comprehensive if you build it collaboratively with your stakeholders. It’s easy to do this in Lucidchart because multiple participants can edit a document in real time even if you’re not in the same location. If you’re feeling stuck or need a leg up, try using one of these customer journey mapping templates. If possible, recruit the help of a designer to make your deliverable visually pleasing. The faster your audience can understand your findings, the easier it will be to implement, and that’s the whole goal. If you don’t have access to graphic design resources, spend some time polishing your customer journey map in Lucidchart. You can add colors, images, and other custom formatting to make a polished, professional document. This is where the real work begins. 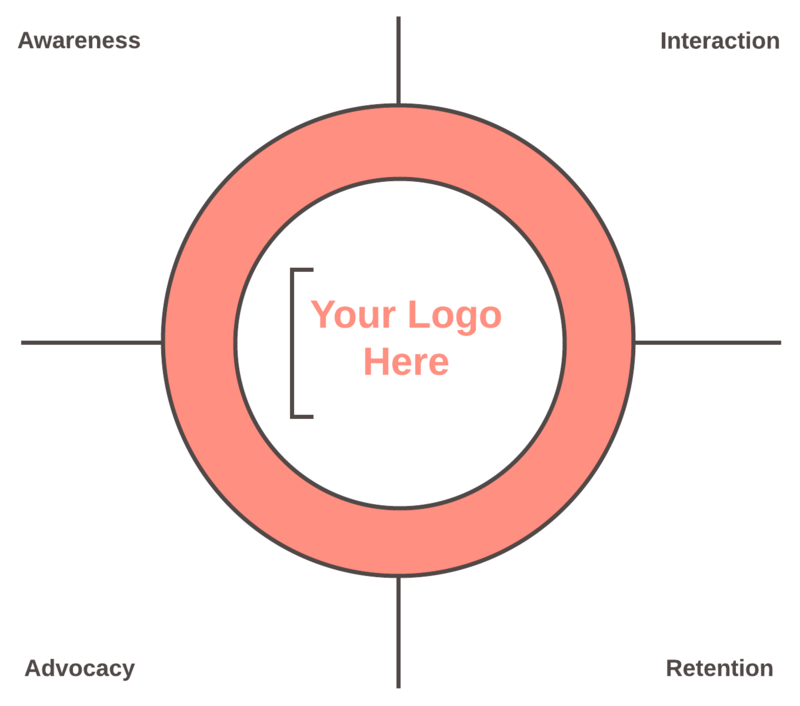 Now that you’ve visualized your “as-is” customer journey, your map will probably show some gaps in your CX, places with information overlap, or poor transitions between stages. To fill those gaps visually, start by using Lucidchart’s hotspots and layers to easily map out potential solutions and quickly compare the current state of the customer journey with the ideal state. Presenting your findings company-wide can bring everyone on the same page and help individuals better understand their role in improving on the customer journey. As a visual follow-up, share your Lucidchart documents with the entire company or print your diagrams and plaster them on your office walls. Customer journey mapping is not just a one-time initiative when it’s done successfully. It becomes part of the company culture, enabling everyone to fit the pieces together and create a seamless experience. Once the plan has been clearly communicated, assign responsible parties to make sure the gaps that you’ve identified are bridged successfully. Interview your customers regularly to evaluate the effects of certain changes and make sure teams know to update the central customer map when they are adding an element to the customer experience. Looking at the impact of managing the customer experience, companies see an average of 24.9% YOY increase in incremental revenue associated with marketing campaigns, a 21.2% reduction in service costs, and a 16.8% shrinkage in the sales cycle when the customer journey is mapped and managed successfully (Aberdeen Group - Customer Journey Mapping: Lead the Way to Advocacy). But understanding a customer’s journey across your entire organization does so much more than increase your revenue associated with marketing campaigns, reduce your service costs, and shrink your sales cycle. It enables you to discover how to be consistent when it comes to providing a positive customer experience and retaining customer loyalty. Increase customer engagement through channel optimization. Identify and optimize moments of truth in the CX. Shift from a company to a customer-focused perspective. Break down silos between departments and close interdepartmental gaps. Target specific customer personas with marketing campaigns relevant to their identity. Understand the circumstances that may have produced irregularities in existing quantitative data. Assign ownership of various customer touchpoints to increase employee accountability. Make it possible to assess the ROI of future UX/CX investments. By following the process we outlined above, customer mapping can put your organization on a whole new trajectory of success. According to the Aberdeen Group, only 36% of companies currently have a process in place for mapping customer journeys. Making the investment to map your customer journey and solidify that process as part of your company’s DNA can result in significant advantages in your competitive landscape, making your solution the go-to option that customers love. Let us know how it goes! We’d love to hear from you in the comments below.